Game of Thrones’ Boy King Rules Westeros. But Who Will Rule Him? The show may have slightly aged Tommen up to help with his impending marriage to Margaery. It’s a little less disturbing if he seems closer to the age where he could consent to it; plus, it makes him appear to be more of a power player. In the books, Margaery gives Ser Pounce (and two other cats) to Tommen to influence him because he has the innocence of the child (for one, he thinks being king means he can outlaw beets). On the show, she influences him by taking his innocence. This wasn’t a problem when Tywin, his grandfather, was the one doing the manipulating. In his role as Hand of the King, Tywin, effectively, was king, and Tommen his apprentice, although the boy may not have realized it. 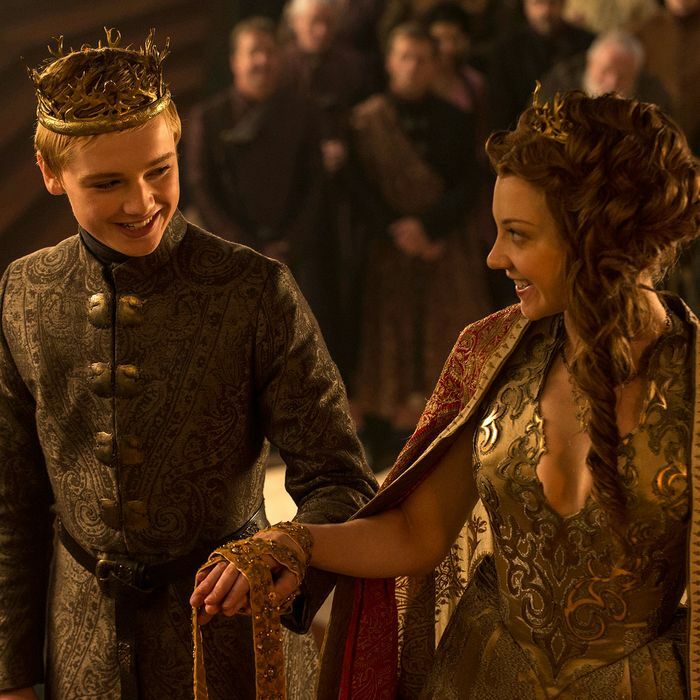 “A wise young king listens to his councilors and heeds their advice until he comes of age,” Tywin tells Tommen. Tywin tries to advise him that winning the throne and ruling the kingdom aren’t the same thing, and hidden within that is a nugget about attending Small Council meetings. But have we seen Tommen at the Small Council meetings ever since? Neither option offers Tommen the wisdom and direction he needs as king. Both Cersei and Margaery make decisions that are ultimately about themselves, not the realm. Cersei’s actions are more apparently selfish, but Margaery is no less of a social climber. This is her third marriage to her third king. While the bodies of her first two husbands were still lying in state, she made her wishes known. “I want to be the queen,” she said, looking at Renly’s dead body. “So am I the queen?” she asked after Joffrey’s murder. She didn’t care if she were married to a monster because at least “I would have been the queen!” she told her grandmother. Sure, Margaery seems kinder — to Sansa, to Brienne, to strangers — but her charitable work serves a dual purpose: It benefits her to be the queen loved by the people. What advice would Margaery actually have? “Whatever you need to do” is what she told both Renly and Joffrey, which suggests that she’s really more hands-off, even when it involves something she would oppose. Remember, she supported Joffrey when he suggested making homosexuality punishable by death — never mind how that would affect her brother Loras. And throughout Tyrion’s trial, even when she knew that the proceedings were a farce, she did nothing. Surely there could have been a way, without implicating her grandmother, to help save an innocent person? One of the judges was her own father, an easily manipulated man if there ever were one. Power — not reform, nor justice — is her priority. Who Will Rule Game of Thrones’ Boy King?